This is an account of some of the highlights that I observed and experienced at the 2016 FAC Nats. The journal includes photos and movies that will help complete the visuals. Each year there are many many stories from the flying field in Geneseo...these are mine. This journal is dedicated to the loving memory of my father, Donald "Dee Jay" Hallman, 3.17.21 - 9.20.14, and to longtime flying buddy, Bob Lundberg, 10.7.23 - 3.11.15. These men will forever remain in my thoughts, daily. Ever present, but not fully realized until one gets some distance, change is what comes to mind when recalling life since the last FAC Nats in 2014. Change in family, change via loss, leading to change in my appreciation for free-flight. The birth of a first grandchild is a beautiful experience, a gift leading to a level of love never imagined. Preceded by the loss of the two most influential men in my life within six months of each other, our granddaughter’s arrival pointed strongly to the full circle of life. Two months following the 2014 FAC Nats, I began taking solitary day trips to Barron Field in Wawayanda, NY. It felt like the place to be as I prepared to say goodbye to my dad in the coming weeks. On this trip I flew the DO-X at sunset, along with a few short flights with the electric Airco DH-2. That’s when the healing power of free-flight began. In the remaining twenty-two months until the 2016 Nats, I visited the field another six or seven times. Some were for focused trim sessions with new models, while others were spent flying for pleasure, a reconnection to the joy of this hobby and to those who had inspired me. I began to explore the possibilities of free-flight filmed from above. Viewing this field from 100-300 feet at sunrise to sundown left me speechless, and a bit jealous for what our models had been seeing all along. Flying above Wawaland with a 20 gram mini-cam attached changed everything. The romance of free-flight just ramped up to a new level. My goal for 2016 Nats was to fly in as many scale events as possible, so prep for the contest was crucial. Back at home, multiple motors were cut and lubed for all. Thanks to favorable forecasts, models were trimmed at Wawa during two 8AM - 8PM marathon sessions, a few weeks prior. They all looked ready, but this is free-flight, where anything can happen. All one can do is focus on the models and do your best. Helps to ignore the competition and just fly. The rest is up to the Gods of free-flight. Hung will do what Hung wants to do. For the first time in what became my twenty-fifth visit to Geneseo, I arrived a day early. The fleet was prepared, ready to fly, and I was anxious to see my friends, so why wait? The surprising bonus of being spontaneous was the lack of urgency to arrive before scale judging at noon. So I strayed off the usual path, took the scenic route a few times, and most enjoyably, stopped at the Big Dipper Shake Shack & Bar-B-Que for a cone and a half rack of ribs. What a combo! Could easily become a new Geneseo tradition. This year’s first drive down the familiar gravely road led to the realization that the crops would be on our side. A change from the norm, I noticed short beans, cut wheat, and potatoes, with only far away fields of semi-high corn. From a distance, all looked ideal, but later would prove rather difficult and frustrating for many. I arrived with twenty-six models in my fleet, seven of which were new since the 2014 Nats. The peanut Mr. Smoothie and Martinsyde S.1, the SBC-3 Helldiver for Dimer, the 16” Mr. Smoothie for the BLUR Race, a 16” Pulqui 1 for Jet Catapult, the 35.75” Hodek HK-101 twin for FAC Scale, and the 54” Nicholas-Beazley NB-3 for Giant Scale and Golden Age single wing. All would spend a significant time in the blue during the 2016 Nats. One thought. Hot. Cooker. Oven. Hangar heater. 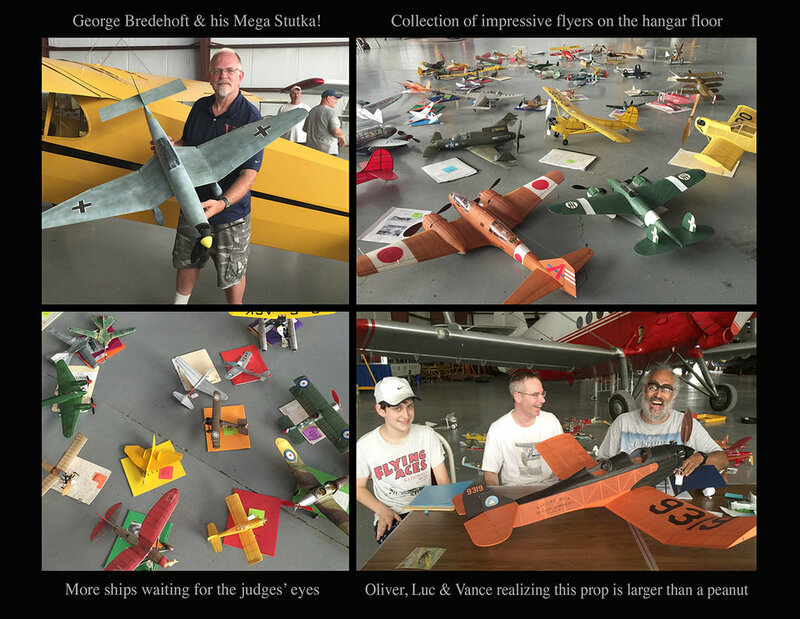 Still, the 100º temps inside the judging venue didn’t lessen the excitement of seeing the scale models of 130 flyers. Somehow, the FACers find a way to raise the bar that is already nearly out of reach for many. If you need inspiration, come to the FAC Nats on scale day. Cheers to all who donated their time to make it happen. Once judging ends around 6PM, it’s open season for evening trim flying. Ships that were kept pristine for the judges’ eyes, are now offered to Hung. All hope and pray that He/She smiles down upon us as we give flight to these beauties. After months and months of planning, it’s finally time. The predicted forecast for the entire contest was not ideal. Day one was expected to be mostly clear with the occasional passing shower, but wind could vary between 8-15 mph. Day two was to push the challenge even further toward the dark side with gusts up to 30 mph. This became our reality, although day three was to bring a calming presence with mild and variable, and cooler temps. To lessen the blow for the scale judged flyers, their events were changed from a total of three flights averaged to the best of three flights. Additionally, mass events on day one were flown in two rounds. Generally, this was well received down the flight line. The increased use of golf carts also helped to speed things along during the downwind chases, if only to arrive at the distant bean fields more quickly. Once there, you were on your own. There’s nothing fast about searching through these crops. Hurried retrieval leads to the slow, methodical dissection of the crop patterns, giving one plenty of time for quiet reflection. Fifteen minutes in, prayers and choice words for Hung & Co. are commonly heard. Thirty minutes along, and most will question and doubt their choice six months prior for that camouflage color scheme, opting against the red tail and yellow spinner version. The truly unfortunate will be back later that evening, and perhaps the day after the show, all the while questioning their tracking skills, making a pact with Hung that “next time” we will use a triangulated approach, and actually remember the line on the distant horizon, fore and aft. Most return to the hobby next season, but for some, I suspect, sadly it’s the death blow. For me, adjusting to the flight line and the start of the contest took longer than intended. The first mass launch event was at 10AM, so I wanted to get a few officials in before then. Once again, I started the contest with one of my Pioneer ships, this time it was the 13” Bleriot XXVI who took the helm. With the air already gusty at 8AM, I was not surprised to see this little triplane-pusher-canard do the aerial version of the silly walk combined with the happy dance, as she looped then performed a few pirouettes before settling in for a stable flight of sixty-two seconds. She’s an up and down flyer, so I was pleased with her first official. It would be the only time she would see air this weekend. Next I was going to fly either the Haines Racer or the Pulqui in Simplified Scale, but I didn’t want to lose either right out of the gate and risk not making other events for both. Still, this is the Nats, and you fly with your best, so I went with the Haines. Fully wound, DT set, I waited a few moments before releasing. She hooked good air, spiraling northward toward the bean field by the runway as she came close to 100 seconds. But her smooth glide turned into a hard right, pivoting turn…that’s when I realized I had not reset the DT position prior to launch. Lack of early contest focus had bitten me, bringing her down just short of a max at 118 seconds. Hopefully I wouldn’t make that mistake again. Back at Pax River in 1989, Dave Rees’s smooth flying Martinsyde S.1 was one of the first WW1 peanuts I had ever seen, and it flew on rails, so it felt like a good choice for the 2016 WW1 Peanut mass launch event. My S.1 had not flown on near max winds since her initial trim session at Wawa back in early December. A short flight on scale night showed she had maintained her trim. But the model had never flown in air over 2-3 mph so I could only feel hopeful that she’d be able to handle the 5-8 mph present during the mass launch. Sixteen flyers were entered in this resurrected event. It was a popular mass launch when I had attended my first Nats in 1990. But unexpectedly, it left the ranks in the mid 90s, leaving my newly built peanut Martinsyde Buzzard feeling unfulfilled. 2016 was my chance to finally join the fun. The little bipe handled the wind beautifully in the first round, lifting to the right across the breeze, circling back into the wind for a few more passes. She easily made it into the second round with a 61 second flight, a few ticks ahead of Dave Mitchell’s fine flying Bristol. With half the field remaining for the final round, I would need to wind as close to max as possible, tempting the torque monster through this previously unknown territory. But she handled it well along with the wind, outlasting three SE5s, a Siemens Schukert, a Bristol, and Ansaldo, and finally a high flying Fokker D8 by Mark Houck for the victory. The flight lasted 78 seconds, with 13 seconds to spare. A good start for the new peanut flyer. Time goes quickly on a day scheduled with three mass launch events. Add the wind, a broken motor or two, long downwind chases, and a rogue model that chooses to play hide and seek in the crops…the flyers may find the next mass launch arriving much sooner than expected. Low Wing Military Trainer was up next at 1PM. A terrific event with twenty-one multi-colored ships from many nations, some which you’d rarely see competing in FAC Scale. A good event addition by GHQ to inspire the building of the more obscure aircraft. First round would see thirteen flyers dropped, leaving eight for the final. A heavy handed mass launch, but that’s the downside of competing in extreme weather. You’ll need to wind as close to max as you dare each round, just to stay in. My veteran Fairchild PT-26 made it safely into the final with a solid flight of 83 seconds. Cut off was 71, which was unfortunate for a few, just seconds away from moving forward. The final round saw many grabbing good air, with the top two giving their best flights by far. Wally Farrell’s Fiat came in at 94 seconds for third, followed by my PT-26 with a 110 for second. But Tom Nallen II’s soaring DHC-1 had a monster flight of 137 seconds to take the kanone! Before the next mass launch at 3PM, I flew the Haines again in Simplified, and started tuning up the Jet Cats. The Haines Racer, which has little trouble maxing on nearly winds alone, reminded me again that this is free-flight, and nothing is a sure thing. Getting crazy choppy, wind-shearish air on her final two flights of only 49 and 89 seconds, she edged out Dave “Edge” Mitchell’s Piper PA-15 Vagabond by a mere second. However, she came up short against Clive Gamble’s Vega Starliner, and Matt King’s Piper PA-16 Clipper, which scored big with two maxes and the victory. Up next was another popular event, peanut Goodyear / Formula Racer Mass Launch. Fifteen pilots braved the increasing wind, much to the dismay of some of the models. Many were down a few seconds after the launch, but Nallen, myself, Farrell and Gorman broke through to the good air for flights of 121, 118, 67, and 58 respectively. The final round of six faced the hand of God as the negative air in runaway elevator fashion meant the end for all. Some descended more quickly than they flew skyward after launch. Where you stood along the flight line determined how fast you’d rise or hit the turf. Tom Nallen II’s Lenor Special outlasted my Snoke Swifty Jr. by two seconds for a 57 second flight. I guess his life support line was a bit longer than mine. Martyn Richie’s Chester Swee’ Pea came in third with a strong flight of 47 seconds. The remaining flyers were down early. With an only hour to go, I brought out my two jet catapult flyers, a veteran Heinkel 178, and my new, bright red Pulqui 1, Argentina’s first jet from 1947. The plan was from the 1970s Lupin comic series, and came via Scot Dobberfuhl a few years back. It caught the eye of Bob Lundberg, who had stopped building rubber jobs, but he still had a passion for catapult gliders. In October of 2014, Bob had selected the wood from his stash of Lone Star balsa, forming the wing and tail panels, along with a very light but strong, three part laminated fuselage. Along with his well marked plan, these rough cut pieces are what I found in one of Bob’s building boxes, after his son Eric gave to me most of his modeling supplies and finished aircraft. Without hesitation, I went ahead and completed what Bob had started. The model looks to be a flyer, and shows potential with assistance from above. I’m a relative novice at jet cat, but the bang for the buck is as good as it gets. Humbling experience trimming these speedsters, but rewarding when they finally roll out over the top, with little drop, continuing on for a long flight. On this day, Vic Nippert’s Hawker Hunter took the well deserved first place, averaging 42 seconds for his six flights. Mike Kaiteris came in at a close second place, just ten seconds out of first, but his Arado 234R had the longest flight of the day by far, a floater of 100 seconds. A flyaway perhaps, as he only posted two flights. Third went to young Gryffin Syme’s DH Venom, which had the second longest flight of the day at 56. He aced out Don Deloach’s Baka by one point. My Heinkel came in at a distant fifth place. But I was pleased to see that the Pulqui reached the top ten. I hope that Bob would have been proud. Clearly, this event remains popular with both young and veteran flyers. With fifteen minutes to go, my day was finished. I could finally relax. However, I looked over and saw Clive Gamble winding his Hydravion MB to max. This contest type floatplane was the spark that led to my discovery of the FAC. At fifteen years old, my dad had ordered the 1936 plan through a Parisian hobby shop. I had discovered the plan more than fifty years later at a family gathering. One look and I was inspired. I simply had to build it. Clive and two hundred other modelers acquired the plan via Earl Van Gorder’s column in FM, securing it’s place in free-flight history. On this windy day, she was set to rocket off the card table for her final flight in Oldtime Rubber Fuselage, and I was ready to film her. An improbable flyer, she had maxed numerous times over the years, grabbing serious ozone with ease. Not to diminish Clive’s trimming skills, but I suspect from time to time, my late Pop is willing her closer for a better look. Spiraling toward the sun, quicker than any floatplane I’d ever seen, the Hydravion reached impressive altitude in seconds, ignoring the strong wind that looked to knock her out of the sky. Circling confidently to the right, she headed toward the crops to the east. At 300’, she looked down and passed the field with ease. This is where my camera could no longer keep her in focus, so I switched to my binoculars. I lost sight of her as she neared the tree line by the main road, a mile away by the college. Fortunately, Clive had a line, so we gave chase in his car. Once on the Main road, we checked the dormant excavating company’s lot, primitive with gravel and sharp rocks, bordered by years of weeds gone wild. We looked about in a few other lots, then drove back toward the field via a tractor path to re-establish the line. It helped, as Clive realized the ship had gone further toward the school. I searched five minutes on the tall natural grass bank, then walked through a darkened, branch covered arch, leading to a construction area for the college. Looking through into the brightness, I yelled, “YOOTI-HOO-YOOTI-HOO! !” There, fifty feet away with barely a scratch, was the beloved Hydravion, sitting squarely on a gravel road, surrounded by large dumpsters. After an epic flight of over three minutes, with crops, trees, and rough terrain as obstacles, she threaded the needle, centering perfectly through a 150’ opening. I guess Pop took an even closer look this time, held her gently in his hands, then safely released her to fly another day. I suspect that Clive will forever hold a smile of gratitude. The wind remained strong as we returned to the flight line. Many took part in the on the field BBQ dinner at six. As if a switch was flipped, the wind died to only a hint of what it had been all day. Numerous flyers returned to the field at 7:30 to trim for the next day’s events. With a backdrop of whoops and praises to Hung, the sky was crowded with ships of all sizes and colors, until the golden hour faded around 9:30. Clearly a gift from the Thermal Gods on the long, first day at the FAC Nationals. Wind. Again. Stronger than the day before. Ugh. But we were given an unexpected calm window from 8AM until the first mass launch at 10. No time to waste, so I prepared the 13” electric Waterman Aerobile for her first official, riding my golf cart to the field’s mid-point, should she stray in the wrong direction. With Power Scale, you know you’re committed to a two minute flight, so your drift line better be safe and free of obstructions. The Aerobile lifted cleanly into the desired left flight pattern, circle upon circle as if on rails, maintaining a 60-70 foot cruising altitude until the power ran dry. A slow, controlled decent, she landed short of the beans by the runway for a 2:10 max. Having followed her below in my cart, body leaning out to catch the entire flight, it’s two minutes of flying I’ll never forget. But it would be the shortest chase I’d have that day. Getting out of the gate quickly with the Waterman, left me with 90 minutes of flying time prior to the WWI mass launch. I was able to get the jumbo MiG-DIS into the air for her first official. Next came the SBC-3 dimer for a max into the beans, and finally the 20” Scientific Waco YKC for a solid first flight in Golden Age multi-wing. The breeze was picking up as twenty-three flyers gathered for WWI. But my 20” Fokker DVII had handled the wind quite well in the past, so I felt good about her chances to stay clean at launch. She did well in the first round, sliding to the right and back into the wind, circling for a 51 second flight. Ten others didn’t fare as well. Round two saw much of the same, this time with slightly better air. The DVII came in at 70 seconds so I was feeling confident for a reasonable flight in the final. Call it a different batch of rubber, or perhaps a too conservative approach to winding for a final round, but I was coming in 10-15% short of my max wind targets. Still, I wasn’t blowing motors, so at least she’d be flying for a place against the six other flyers. The wind seemed stronger than before, but it’s the same for all of us, so just wind and fly. However, I had become distracted by my DT line, which I hadn’t set. This took a few extra seconds and held up the final countdown. Perhaps that rattled me, or call it simple pilot error, but I lost my focus. Rather than launching slightly right of the wind as I had planned, I tossed her directly into a gust, causing her to lift straight up and onto her back, a position and height from which she was unable to recover. With the Fokker down in only a few careless moments, my second day of mass launch had started with the opposite results of the first. I needed to cool down and regroup. This is free-flight after all. Stuff happens. I considered flying another scale judged event, but it was too windy to risk that. Instead, I treated myself to those ribs from yesterday’s trip to Geneseo. Leftover ribs can cure many woes. Replenished, and tired of hearing myself complain about the WWI mishap, I brought out the Waco and SBC-3 dimer again. Time to try for two more officials before the Greve at 1PM. The Waco gave me a poor flight, but at least it wasn’t a 21 second squeaker. Next, the dimer fought hard for her 83 seconds. Choppy, unpredictable air turned the flight into a rollercoaster. But again, she was at least posting a respectable time under difficult conditions. Round one seemed to end before it began, where simply holding the model was a challenge. I feared folding the wings of the Haines. Getting the timers in line felt like an eternity, but the countdown finally came…..3…..2…..1…..LAUNCH!! Chaos, quickly moved on to mass aerial hysteria, ending for most in fiasco. The Haines did the fastest ever figure nine into the turf. Others flew in left or right, or snatched each other in mid-air. The chosen few made it out cleanly somehow, with the truly blessed having salt tossed into their wounds as their models caught good air, but flew too well toward the school. Some were lost, some were found but difficult to retrieve. Five of the top six flyers were not able to make it back to the flight line for the final round. It opened the door for the rest. Strange thing. Those of us who dorked had smiles on our faces. We had survived, with little damage in many cases, able to fly another day. At least we had that. The remaining eight pilots lined up again. I wasn’t there to see how it played out, instead hiding in the storm cellar along with Dorothy for a few. Richard Zapf’s Goon took first with an impressive 136 second flight, followed by Winn Moore’s Mr. Smoothie at 108. Newcomer Dave Krammes came in with a solid third place finish, followed by Don Deloach and Sam Brauer. A mass event for the ages. In light of the Greve, the Modern Military mass event scheduled for later in the afternoon would be moved to Saturday. A collective sigh of relief was felt down the flight line. With 90 minutes left in the day, I peeked out of the storm cellar, catching the eye of Oliver Sand. The wind was still howling, but I was determined to post my final two flights, while Oliver needed one last flight in dimer. Time to get creative. I grabbed my SBC-3, my binoculars, the portable stake stooge, stuffer stick, and extra rubber. Oliver did the same. Then we took the cart to the far western end of the field near the airport’s windsock, but safely away from the runway. The air was blowing heavy as ever toward the school, over a mile away. Even if we were to hook good air, at least we had a chance of staying on the field. This was the first time I had used Bob’s winder, since I had met him back in 1987. Seemed fitting to note how he was helping out once more. I wound the dimer to max, released quickly, and started my chase in the cart. The model lifted and circled right, weaved left and dropped, then hooked again, climbing higher. She finally fell out over the beans near the wall of trees. I had a line, but the distance would be an issue. Fortunately, Michael saw the flight and also had a line, perfect for triangulated retrieval. Beans are beans, and at knee height, their broad leaves can cover nearly any model, especially in the wind where models drop through and settle. We searched for what felt like half an hour, nearly giving up as we retraced our lines. Both of us were exhausted, in need of fluids. Just then, looking to my left, I caught a glimmer of a small red tail and gave out a victorious “Yooti-Hoo”!! Relief. I wasn’t going to have to re-build this fine flyer after all! When the results came in, she finished second, just ahead of Mike Welshan’s Cessna Airmaster, but well behind Jim Detar’s high flying Waco E.
With only 30 minutes left in day two, I rushed back to the hangar and wound my Waco YKC to max. I drove back to the western edge of the field, but not before asking CD Dave Mitchell about getting my time entered before the gong went off at five. He said to call it in. Perfect. I had what felt like a very good line on her, so maybe I could find the bright orange and black Waco and still get back by five. The corn was much higher than it had looked from one half mile away. Same for the trees, which were not in a line, but staggered and fifty feet deep. Oh boy. At least she’s orange. I checked the trees, I checked a few ditches. Nothing. This was rough, primitive terrain, and not at all friendly to stick n tissue. For the next 15 minutes, I worked my way through the rows of corn, first at 20 paces from the trees, and 20 paces in. Did this four more times at 40, 60, 80 and 100 paces. I tried one last time at 120 paces from the trees, looking high and low through the rows of eight foot high stalks. Then joy….there she was!! About ten rows in, held high on the stalk by the long broad leaves. Oh happy day!! Happy Birthday, too…one of the best ever!! Three models lost, three models found. It’s a good day when you can bring back three. Just then, Dave texted that he had logged the flight time. I texted back a photo of the corn and the recovered Waco. 6:30PM. Until now, the BLUR Race had only been a spectator event for me. Three pilots per round, standing close, side by each, as my Pop would say, flying a racer across two lines 90 feet apart as fast as you can without going out of bounds…this year I couldn’t resist and had to join the fun. This past Spring I had spent quite a bit of time in Smoothieville, first building a 16” job dedicated to the BLUR, and then a 13” version for GHQ Peanut. The peanut was light and airy, while the BLUR racer was robust, with a sheeted nose area and tail surfaces. She came in at 26 grams, more than 250% heavier than the peanut. The rear peg was positioned just aft of the trailing edge, 7” peg to peg, with the CG exactly in the middle. Ideal for trying different motors without the need to mess with the ballast. A single loop of 3/16 rubber, 24” long folded over, supplied the power. One hundred and forty hand winds, with a seven inch prop cut down to six, and you’re ready to go. I hadn’t flown on hand winds since I was ten years old with my Sleek Streak. Out of the gate, flying in this event felt nostalgic. Nearly twenty flyers braved the gusty wind that remained from the day. With a hurricane at our backs, the ships left the line like rockets, or looped and performed aerobatics. Some even hit the ground hard, bounced up and continued on, cartwheeling toward the line. One ship apparently grew scared of the distant line and tried to return to poppa, landing only a foot short of that goal. There were ships of all sizes and colors, even a floatplane. Midairs-o-plenty, something for everyone. In the end, miraculously the new Mr. Smoothie was the victor, scoring first across the line in each of his three heats. Pete Kaiteris’s speedy Jack Rabbit secured second place, and John Houck’s F86D jet came through in third after a four flyer shootout to break the tie. Quite the honor for John, as he was rewarded with nine million drachmas though the generosity of Bernard Dion! Many remained at the windy field, still buzzing from the BLUR. None of those who stayed could have ever imagined that, on this day of constant wind nearing 30 MPH at times, Geneseo’s golden hour would once again flip the switch, turning off the wind machine around 8PM. But dead calm in the late hours has been a long running tradition at Gtown, and it’s to be expected. Tonight’s was indeed another gift. The Weather Gods saved the best for last, giving us a day of slightly cooler temps and manageable air. Today there would be no holding back. Scale ships that were shielded from windy disaster in the days prior, would be offered to Hung & Co. in full force. I suspect that over 50% of all scale judged flights posted throughout the Nats were flown on this more perfect day. My card was full with mass launches, scale, and duration events. I’d have to keep all of the ducks in a row to reach my flight goals. Hopefully, few would stray and hide in the crops, soaking up valuable time. With yesterday’s Modern Military mass event rescheduled for 9AM, we would only have 45 minutes to post a few official flights, so I readied my new 35.75” rubber twin, the HodekHK-101. Taking five months to complete, she was my major project for 2016. The Hodek had been to the trim field a few times, with each session improving her flight pattern. She looked close to ideal, so I felt she was ready to post her first official. Preparing a twin for flight is akin to defusing a bomb (I imagine). Total focus is required, working through the methodical routine of winding with blast tubes for the left and right nacelles, making sure that you wind in the opposite direction for the left side. Yes, always wind opposite. With 1520 turns in each nacelle, she launched into beautiful calm morning air, making a wide, sweeping circle to the right along the flight line. Turning back into the air, she rose a bit, then settled in for another circle or two and a respectable 85 second flight. It was a long time coming for this ship, since I had first laid down balsa nearly a year earlier. It’s always memorable, giving a new bird her first official. Next up was my 54” Mega flyer, the Nicholas-Beazley NB-3. She launched into mild air, but lacked the torque and lift to give me anything more than an average flight of 79 seconds. Still, a good effort as she slowly circled the field. That quickly, it was time for the Pulqui and the Modern Military mass launch. The air was nearly dead calm with an undetermined drift, so the eight pilots gathered mid field, slightly north to improve our chances. The event would be run in only two rounds as an effort to speed things along, since the Thompson Race was up next at 10AM. The first round was classic. Launched into good air, a few dropped out early, but half the field continued on for much longer flights. Memories of the epic Modern Military event from 2003 or so, as once again, Gene Smith’s gentle flying MiG-9 cruised slowly overhead, this time thirteen seconds after the previous flyer was down. For the final round, there was no holding back, wind to max as close as you dare. I wish I had listened to my own observation, as once again, my count came up far short, with the motor becoming hard a few hundred turns early. It cost me. Mark Houck’s F-117 Stealth was down early, leaving the final four to battle it out. My Pulqui rose quickly, then dropped a wing and stalled…CG was probably on the edge for max climb. But she righted herself and settled into a long cruise mode. The game had begun. We all had the air. It was anyone’s battle to win, as the four military flyers floated nearly directly above. Falling out next was Richard Zapf’s F9F. His 97 seconds could have been the victor on another day, but on this morning he was fourth. That left it up to Smith’s MiG-9, Don DeLoach’s Bearcat, and my Pulqui. With no time to waste, I ran back to the hangar and put up a short trim flight with the Loose. I wanted to be sure she hadn’t lost her trim since last night’s damp air. Over the years, that misstep had bitten a few of us. This time around, the Thompson featured twenty-three racers for the most colorful event at the Nats. Three rounds of solid flying in good air led to plenty of aerial action. Steve Blanchard’s Loose took fifth, followed by Jim Detar’s Altair. Third place was taken by Pat Murray’s Mr. Mulligan, edged out by my Loose Racer which took second. The class of the field this morning was once again Don Deloach, whose Cessna CR2 bettered the field by nearly a minute with a majestic flight of 2:32. The next mass launch was a distant 2.5 hours away, leaving a large window for official flights in numerous events. My first times in Peanut GHQ were posted for the Mr. Smoothie and the Martinsyde S.1. The veteran 18” Tri Pacer was able to soar out of the gate for a 1:43, followed by an average flight by the Smilin’ Jack X-13 in Fiction Flyer. With those four on the way, I decided to prep the Jumbo MiG-DIS. Her earlier flight was good, but not the max I was looking for, so I wanted to test the air again. Standing mid-field by the gravel road, I watched the mylar streamer shoot up strongly. Waiting an extra second or two, I launched the twin into what one could call an elevator controlled by the Joker. Thirty feet out of my hands, the MiG pitched vertical and started to fall back, but was able to recover, sliding left and pivoting northward with the growing thermal. With a dark green model the exact color of bean leaves, I didn’t know if I should chase through the crop on foot, or drive the long way around. Most importantly, I needed a clean, straight line for tracking, so I stopped at the edge of the beans and waited, praying for her to land. She finally came in at 3:35, her best flight ever, since breaking out in 2012. My line was good. I didn’t mind walking the 300 yards to the other side, where she had landed just forty feet from the runway…. I should have driven around, saving a bit of time and energy, but nothing was going to remove the satisfying smile from my face. She had just ridden and survived the Joker’s thermal! I chose to fly my 27” Seafire in the WW2 mass event at 1PM. The MiG-3 could have taken her place, but the Seafire was in trim and looking much better than the MiG, plus I love seeing her fly. She had earned the right to be on that line again, along with the other forty flyers. This event was sure to be a barn burner. It took awhile to get everyone on the line, which continued to grow like a snake. Fifteen positions from the far left, I was surrounded by Fiats, P-51s, Sturmoviks and Hurricanes. My goal was to get up and away from the line as fast as possible, then slide left into a circling pattern. After what felt like a few minutes with wound motors, the countdown finally came. 3…2…1…LAUNCH! I’ve often heard that when facing disaster, a quiet calm, a nearly silent slow motion takes over followed by rapid carnage. That didn’t happen. This time it was fast, loud and brutal. The launch was perfect, the path as intended. What didn’t fit was the distinct impression that the ghost of boxer Sonny Liston had just shown up for the battle. As the Seafire started her turn just twenty feet away, she received in quick succession a heavy body blow, then a lightning quick upper cut as she tumbled back disoriented, hard into the turf. 1-2-3- - -10, you’re out!! Done. Bring in the medic. It must have taken ten to twelve seconds for my eyes to blink and my mouth to close. Pilots on both sides looked around in stunned silence. Had that really happened?? We felt numb. I assumed more of that happened up and down the line. I couldn’t say. To be expected in the largest mass launch at the Nats, I suppose. We collected the pieces and headed back to our hangars. Surprisingly, the Seafire avoided major damage. The left side stab was bent up at a 45º angle, but that was merely the 1/16” aluminum tube for the DT pivot. Her nose cone was shattered into 4-5 pieces, and she had some minor tissue tears, but she’ll easily live to fly another day. I didn’t stay to watch the last two rounds, but I heard there were some boomer flights. Wally Farrell was The Man this year, with high scores in each of the three rounds. His Srull designed Heinkel 110D posted a 2:26 in the final, topping Luc Martin’s Arsenal by 47 seconds. Third went to Mike Kateris, followed by Pat Murray and Jim Detar. The final couple of hours at a Nats are often filled with reflective contemplation, immediate nostalgia for this latest Geneseo marathon. But this time I wanted to go out in a blaze, challenging myself with a four player round robin, eight flights to the finish with Mr. Smoothie, the Tri Pacer, Smilin’ Jack, and the Martinsyde. The midair in WW2 freed up the time, allowing this to happen. Of the four, the Mr. Smoothie shined the brightest, bringing in two soaring flights of 91 and 100 seconds, enough to squeak out a win in Peanut GHQ. She picked up where my first Smoothie had left off at the 1996 FAC Nats, where she went OOS in a late day thermal. Twenty years later, it was great to have her back. The other three ships put in flights good enough to place, except for the Tri Pacer, who came up a bit short in Modern Civilian. She has battled hard throughout the years, and deserves a retirement spot in the hangar back home. That quickly, competition at the 2016 Nats was over. Three days of dawn to dusk flying seemed to have gone by in a flash. So many models, so many flights. Truly heaven on earth for those who enjoy free-flight. After a relaxing yet spirited breakfast together at the Omega Grill, a dozen or so flyers headed to the field for one more look, and maybe a few flights. The air of course was perfect. Light and variable, 3 mph tops. Earlier in the year, there was talk of a 54” span Mega mass launch, with perhaps six or seven models, some with on-board mini-cams to document the flights from above. But reality kicked in, with most already homeward bound. However, Doug Beardsworth was ready for the challenge, fitting his 54” Aeronca with the extra 20 grams of mini-cam payload in MacGyver fashion, just above the cabin, lens facing the tail. My Nicholas-Beazley NB-3 was also ready, mini-cam pointing forward, secured in the rear cockpit. We made two attempts, with the second giving us a sense of what we were hoping for, an aerial view of our field, the surrounding crops, and distant town. The Aeronca launched first, followed a second or two later by the Beazley. Unfortunately, Doug’s ship did not take well to the extra drag and slowly fell in, but the NB-3 carried on, rising in three or four large circles to the right, until she reached a height of two to three hundred feet. From that high point, framed by the brilliant blue sky and billowy clouds, she started her glide into the mild breeze, free-wheeling for another fifty seconds. She slid in softly for a perfect landing and a max flight, ironically her best of the week. We continued flying until two in the afternoon, enjoying every minute. But with so many amazing flights behind us during the past few days, it was finally time to head home. Change is bound to happen, forcing us to regroup and redirect our focus. Another FAC Nats in Geneseo…much had changed since the last, yet on the field, the camaraderie and FAC spirit remained. Leaves one to feel, may some things never change.